Figure 6.37 NASA centrifuge used to subject trainees to accelerations similar to those experienced in rocket launches and reentries. (credit: NASA) (b) Rider in cage showing how the cage pivots outward during rotation. This allows the total force exerted on the rider by the cage to be along its axis at all times. This is College Physics Answers with Shaun Dychko. The astronaut centrifuge has a centripetal acceleration of ten g's we're told, and the astronaut is 15 meters from the center of rotation which means their radius of the circular path they're traveling in is 15 meters. So, we can write down this formula to find the angular velocity. We have centripetal acceleration equals the radius of the path times the angular velocity squared. So we'll divide both sides by r and then switch the sides around. Then square root both sides and we get omega, the angular velocity, is the square root of centripetal acceleration divided by the radius. So that's the square root of ten g's which is ten times 9.8 meters per second squared, divided by 15 and we get 2.56 radians per second. Now, when the centrifuge is running, there is a pivot here. There's an arm connected to the center where there is a motor. This pivot here allows the cage in which the astronaut is sitting there, sitting like this I suppose, it's going to be swinging outwards and there's going to be this angle theta below the horizontal. The force exerted by the arm is along this bar that's here. I've shown that in this blue arrow labeled F subscript a for arm. 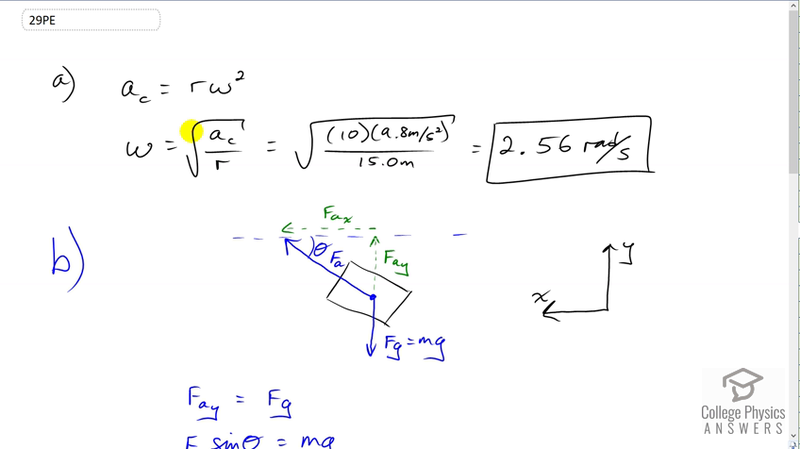 There is also going to be gravity straight down, F g which is the mass of the cage and astronaut combined, times the acceleration due to gravity. So, our job here is to find out what this angle will be, and we know that the vertical component of the force exerted by the arm has to equal gravity because there is no acceleration vertically. So equals force of gravity which is m gand F a y is the opposite leg of this triangle in yellow. So we use sine of theta multiplied by the hypotenuse F a to calculate the vertical component of the arm force. Then we can divide both sides by F a in order to solve for sine theta. That's as far as we can go because at this point we have an equation with more than one unknown. We don't know what F a is and we don't knowtheta so we can't solve it. So we need to find a new equation and so we'll consider the horizontal direction. We know that the horizontal component of the force applied by the arm is the centripetal force because it's directed towards the center of the motion. I've set up my coordinate system to have positive x pointing to the left just to make things convenient here. We'll substitute for centripetal force as mass times centripetal acceleration and we know what the centripetal acceleration is. We're told that it's ten g's. On the left side here we have F a times costheta because F a x is the adjacent leg of this yellow triangle. So we use cosine theta times F a to find it. Then we'll divide that by cos theta on both sides to create this formula which is something we can substitute into the formula with the sine theta and then we'll get rid of this unknown F a. So we do that on this next line here and so we have sine theta equals m g and then I'm multiplying by the reciprocal of this because I find that more convenient to look at. I don't like having fractions within fractions. To me that's confusing so, instead of writing m g divided by m a c divided by cos theta, I'm writing >i>m g multiplied by the reciprocal of this. Then it's easier to see that the m's cancel and we can also divide both sides by costheta and we get sine theta over cos theta on the left equals g over a c on the right. Now, sine theta over cos theta is a trigonometric identity of tan theta and on the right hand side, we have g over a c. But a c we're told is ten g's is the centripetal acceleration. So we substitute that and see that the g's cancel leaving us with one tenth. So that means theta is the inverse tangent of one tenth which is 5.71 degrees.